The perfect way to spend your nights in Volcano Village is in the private luxury of a vacation rental. There are many vacation rental possibilities in Volcano Village that vary widely in price/quality and luxury. 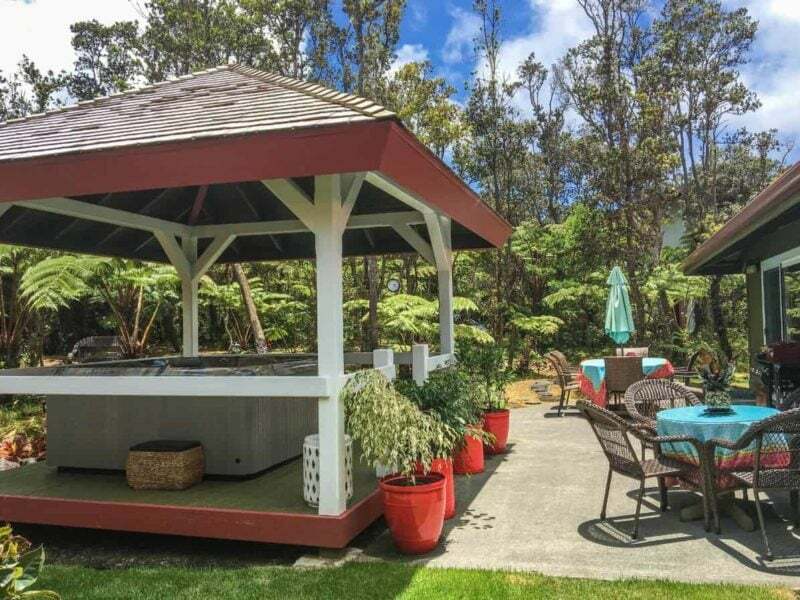 Most vacation rentals offer luxuries like a hot tub and fireplace, and are located in the lush rainforest within a mile from the Hawaii Volcanoes National Park. 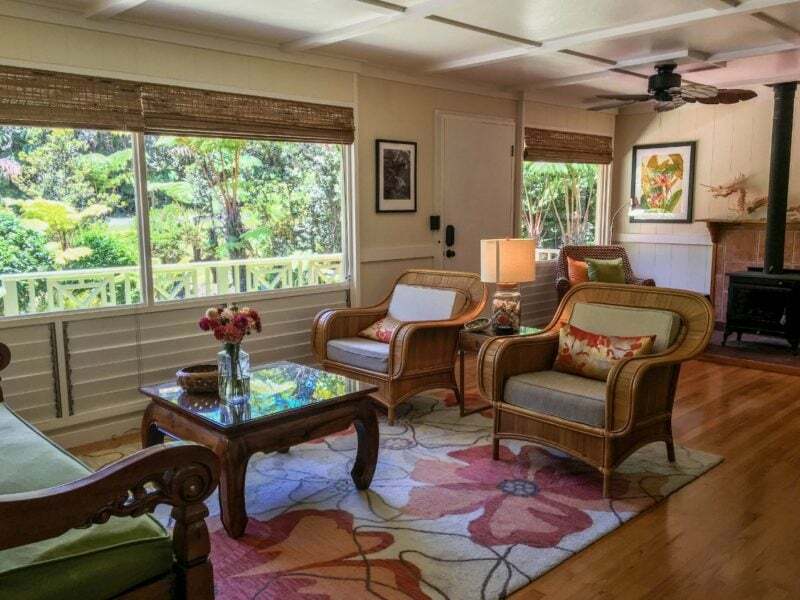 They offer a completely private, self-sufficient, romantic setting for an especially memorable Hawaiian vacation getaway. They are also well suited for families. 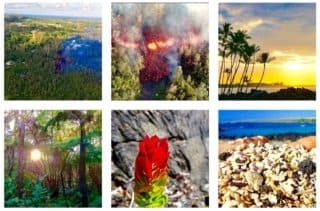 We warmly recommend the vacation rentals of hawaiivolcanovacations.com because of their consistent high level of service, hospitality, and quality. Cost: $155.00 per night (double occupancy). $20 per extra guest, per night. 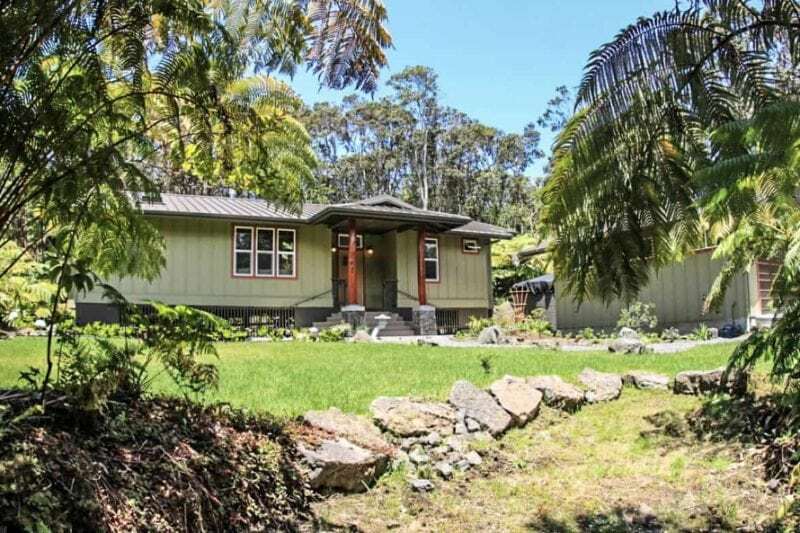 This custom-built home is nestled within an ancient Ohia Forest surrounded by huge Hapu’u ferns, with private outdoor seating and lovely rainforest trails. All the amenities to satisfy the most discriminating tastes are present in the home, including luxurious bed & bath linen. The bedroom is equipped with a queen-sized bed and, with the single balinese daybed in the living room, this house comfortably sleeps up to 3 guests. Outside at the back there is a private covered deck with outdoor seating and WEBER grill. Cost: $159.00 per night (double occupancy). $20 per extra guest, per night. 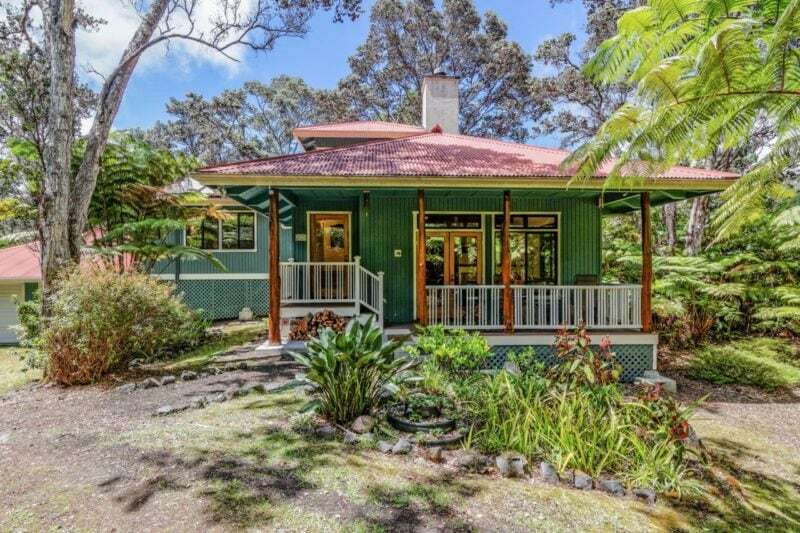 As its name suggests, this 4 bedroom, 2.5 bathroom home in Mauna Loa Estates is an oasis of luxury, tranquility and unparalleled privacy. 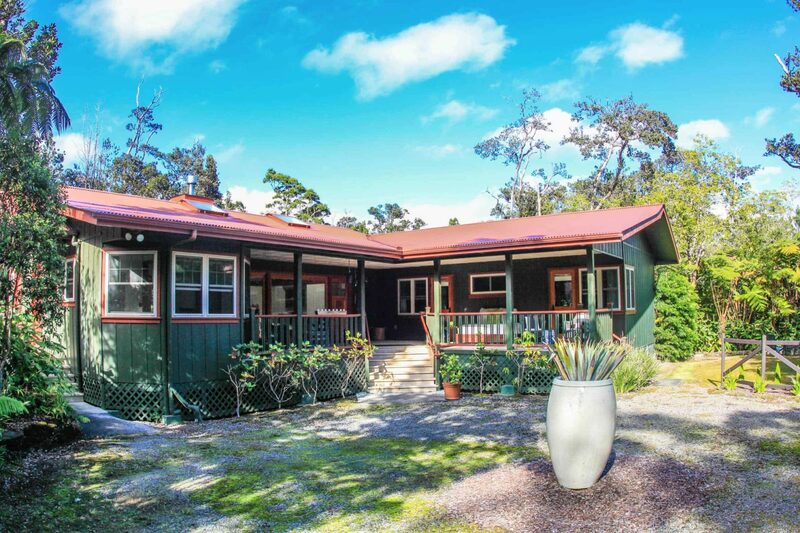 This home has just come on the market and all furnishings, linens and appliances are brand new! Located just minutes from the park entrance and lovely Volcano Village where you can find restaurants, cafes, galleries and gift shops. With king sized bed in the master bedroom, en-suite bathroom with jacuzzi bathtub and his and hers vanities. Two large bedrooms with queen-sized beds and one bedroom with two twins that can be converted to a king offer the space and privacy for you to feel right at home, even if you are traveling with a large group. Each bed is equipped with plush electric blankets. Full open kitchen with dishwasher, microwave, hand-mixer, blender, toaster, coffee machine and full set of brand new dishes, glasses and cookware. Spacious laundry room. Fireplace and wraparound sofa in living room. 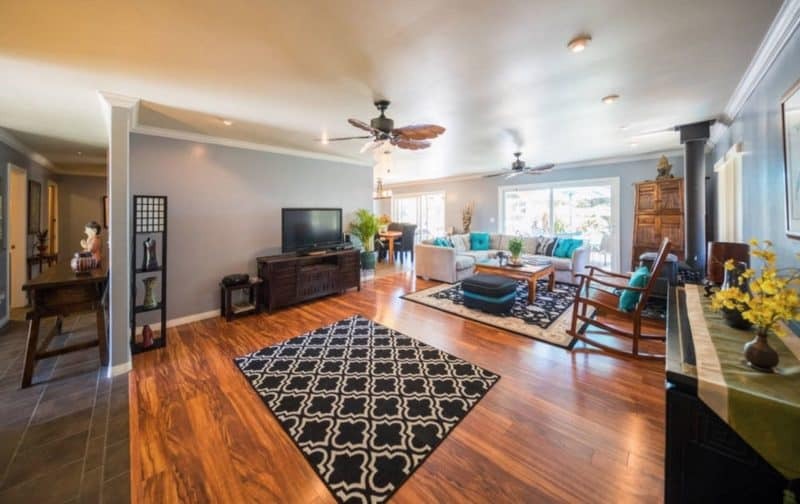 HUGE flatscreen television in living area, smaller flatscreen television in master bedroom. Free highspeed wireless internet, complimentary tea, coffee, hot chocolate, creamer, sugar and fresh-cut flowers complete the experience. Cost: $199.00/Night double occupancy + $20 per Additional Person; Occupancy: 10 People. Rooms: 4BD/2.5BA One king sized, two queens and two twins. Amenities: Full deluxe kitchen, gas BBQ, walk-in closets, reading literature, large flatscreen TV with cable in living room, second flatscreen TV in bedroom, CD player, FREE internet/DSL, plush electric blankets, 100% cotton spa robes, beach chairs, beach mats, cooler, towels, bedding, linens, futons.